I'm not so sure what to think of the the new SkinIt iSkins. Personally, I love them. But as a rights and intellectual property advocate, I'm not so sure if I support it. There is a process of licensing, standardization, and distribution - be it peripherals, software, or even resale shops - that everyone must go through to develop for Apple. My feeling is that SkinIt has none of these certifications, yet they MUST reproduce likenesses of Apple hardware (which are patented designs) and even reproduce a copyrighted/registered trademark symbol - via the Apple logo. 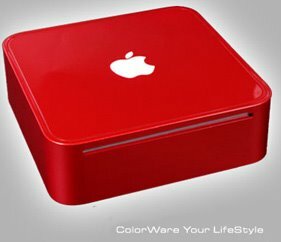 I love the SkinIt solution - it's very neat and doesn't require you to permanently change the iPod or MacMini like COLORWARE painted Macs do. And, it's a heckuva a lot cheaper than a colorware Mac. But, herein lay the difference - Colorware is a Authorized Apple Value Added Reseller and Developer - SkinIt is not. Note: Some of the logos included on this site are the trademarks or registered trademarks of their respective companies, and are provided as a convenience only for their lawful use. It is the expressed intent of SkinIt.com that any unauthorized use of these items by the purchaser shall be the sole responsibility of the purchaser. The purchase of any item fromSkinIt.com is not authorization for the use of any specific logo or trademark. By purchasing said logos, you are indicating that you have authority, if needed, to use the artwork. Interesting, I hope Apple let's them be. But, just to note, if Apple wanted to they could shut em down or Colorware could complain if they saw business drop!